A gale force warning remains in force for Vanua Vatu, Oneata, Moce, Komo, Kabara, Namuka-I-Lau, Fulaga and Ogea while a strong wind warning remains in force for the rest of Fiji. A heavy rain warning remains in force for Lau and Lomaiviti groups, Kadavu and nearby smaller islands. Category 1 Tropical Cyclone Mona was located about 140km east-northeast of Vanua Balavu and about 230km east of Taveuni earlier this morning. Cyclone Mona has winds of about 85 kilometres per hour with momentary gusts of about 120 kilometres per hour close to the centre. 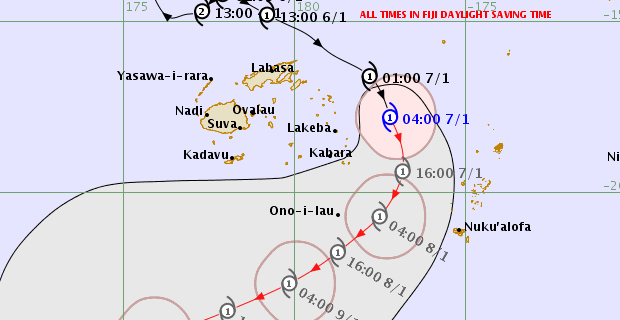 Cyclone Mona is moving southeast at about 39 kilometres per hour and on the forecast track the centre is expected to be located about 200km east of Lakeba or about 230km east-northeast of Kabara at 1pm today. There is a flood warning for all low lying areas and small streams near the Rewa river, Naqali river and Bagata river in Labasa. 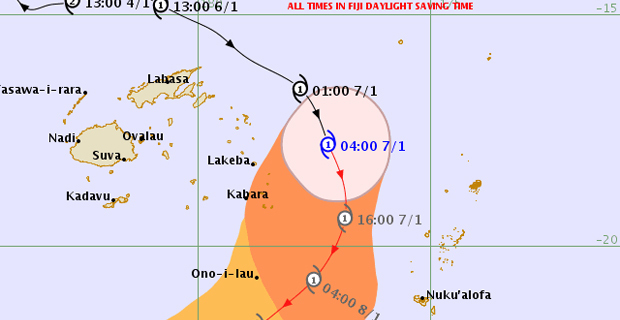 The Nadi Weather Office says that Tropical Cyclone Mona is expected to leave southern Lau waters later tomorrow or Wednesday.